Science teacher educators, curriculum specialists, professional development facilitators, and K–8 teachers are bound to increase their understanding and confidence when teaching inquiry after a careful reading of this definitive volume. Advancing a new perspective, James Jadrich and Crystal Bruxvoort assert that scientific inquiry is best taught using models in science rather than focusing on scientists’ activities. 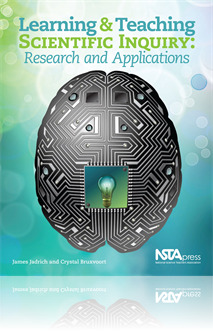 The authors place additional emphasis on sharing cognitive science research that provides valuable insight into how students learn and how instructors should teach. Educators will find detailed examples, practice problems, activities, and lesson ideas that apply research findings to practical scenarios for the classroom. Extensively researched and pilot tested in both classrooms and professional development settings, Learning and Teaching Scientific Inquiry will help teachers integrate authentic scientific inquiry into their science programs.